The X34 is a single lane x-ray solution designed for the inspection of a wide range of packaged products. It offers automated product set-up coupled with intelligent software to improve production uptime, reduce manufacturing costs and enhance detection sensitivity. The X34 provides the ultimate in product safety with minimum False Reject Rate (FRR). X-ray inspection systems provide reliable contamination detection within products in a wide range of retail packaging. X-ray systems for glass containers offer unsurpassed physical contamination detection, even in blind spots such as the base of the container. 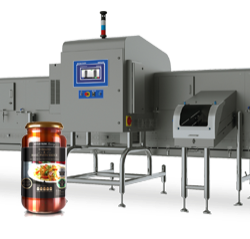 X-ray inspection equipment provides outstanding contamination detection with complete quality assurance for food packaged in cans. A wide range of primary and secondary retail packaging can be inspected, regardless of shape and packaging material. X-ray systems can simultaneously detect contaminants, measure mass, check fill levels, detect product trapped in the seal, detect missing and damaged products at high production line speeds. Safeline designs energy efficient and adaptable x-ray systems ensuring a future-proof investment and reducing the Total Cost of Ownership (TCO). Safeline x-ray inspection systems offer reliable detection of glass-in-glass and other dense contaminants within a wide range of glass containers, ensuring complete product safety. Glass-in-glass x-ray detection systems automatically detect and reject contaminated glass containers from the production line, at high line speeds. X-ray systems are capable of simultaneously performing a range of inspection routines for glass container applications, such as contamination detection and quality inspection eg fill level inspection, cap inspection etc. Angled or multiple x-ray beams options can optimise detection in the base, neck and sidewall of the glass bottle or jar by reducing inspection blind spots. Detection of contaminants including metal within food, beverages and pet food packaged in a variety of metal cans. Product integrity checks, such as monitoring fill levels and detecting damaged cans, can be performed simultaneously to contamination detection. X-ray systems for metal can inspection offer complete inspection coverage, increasing the probability of contaminant detection. Canned food x-ray systems simply straddle existing production conveyors and take up minimum line space, providing quick, easy and cost effective inspection. 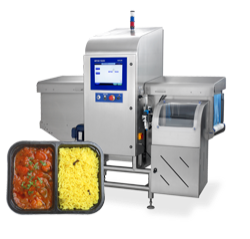 Safeline's x-ray detection equipment provides unrivalled contamination detection in unpackaged food products. Bulk x-ray equipment provides outstanding physical contamination detection and quality control in bulk-flow (loose) food products prior to packaging. Pipeline x-ray systems provide unsurpassed contaminant detection in pumped products (typically meat and poultry), slurries, semi-solids and fluids. 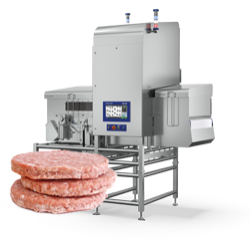 Inspection of unpackaged food such as burger patties (meat, poultry, fish or vegetarian) and other frozen-formed products as well as pumped and bulk applications. Food x-ray inspection systems are specifically designed to detect unwanted contaminants within the product, regardless of their shape or location. X-ray machines placed early in the production line ensure contaminants can be removed at the source before further value is added, reducing food waste and saving costs. Safeline's x-ray systems deliver high detection sensitivity ensuring accuracy, reliability and ease of operation for all unpackaged products. Inspection of bulk, loose and unpackaged conveyorised food products, typically nuts, cereals, fruits and vegetables, meat and pet food, before processing and packaging. Detection sensitivity is increased due to a homogenous layer of product during inspection, ensuring easy contamination detection. A troughed belt and adjustable levelling plates retain product on the belt, minimising spillage and improving the transport of the product at a constant depth at high production speeds. Bulk food products are inspected and the non-conforming portion is removed via multi lane reject systems before further value is added. Food x-ray inspection of slurries, semi-solids and fluids in meat and poultry, dairy and bakery products. Pipeline x-ray inspection systems deliver outstanding detection of contaminants such as calcified bone, glass and metal plastics protecting consumers and helping manufacturers avoid product recalls. 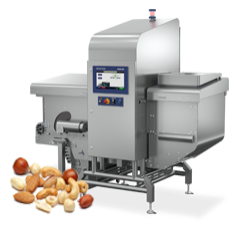 X-ray equipment for pumped foods is capable of inspecting food products at a rate of up to 18 tonnes per hour, dependant on application, without damaging the product. X-ray systems for pumped food are typically used to inspect products at the early stages of production thereby minimising food waste and saving costs before more value is added to the product itself. We support and service your product inspection equipment through its entire lifecycle, from installation to preventive maintenance and calibration to equipment repair. Safeline X-ray's guide is a definitive reference for all those involved in any aspect of food and pharmaceutical safety management. It explains how manufacturers can develop an effective x-ray inspection programme to catch contaminants and monitor the consistency of product presentation and quality. White paper explaining how food manufacturers and brand owners can benefit from consistent conformity of packaged food. Kuchenmeister has been relying on METTLER TOLEDO product inspection equipment for 20 years, for inspection of their baked good applications. What are the benefits of using an x-ray inspection system in food and pharmaceutical production lines? Food and pharmaceutical manufacturers use x-ray inspection systems to maximize product quality and safety. Advanced systems are able to detect physical contaminants in products whilst simultaneously performing a wide range of in-line quality control checks. Installing an x-ray inspection system protects the brand and reputation of manufacturers while avoiding the risks of potentially expensive product recalls. What contaminants can an x-ray inspection system detect? X-ray inspection is highly effective at detecting a range of dense physical contaminants including all metals, glass, mineral stone, calcified bone and high-density plastics and rubbers. In addition to identifying contaminants, x-ray systems can perform a wide range of in-line quality control checks for product integrity, including; measuring zoned and gross mass, identifying missing or broken parts, monitoring fill levels, detecting product trapped within the seal and checking for damaged products and packaging. How safe is the use of x-ray inspection in food or pharmaceutical products? The radiation dose levels used for x-ray inspection in the food and pharmaceutical industries are extremely low and have no effect on product safety, flavor or texture. 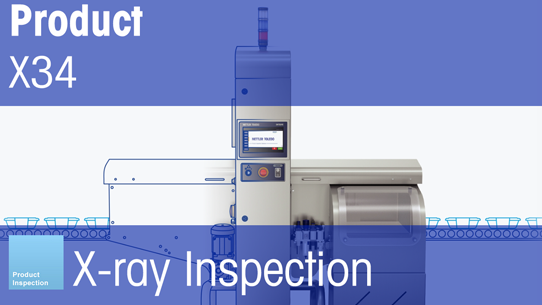 The use of x-ray inspection equipment is highly-regulated and increasingly common. Modern x-ray systems are perfectly safe in working environments as long as recommended safety guidance is followed. White Paper: How Safe is X-ray Inspection of Food? On-demand Webinar: How Safe is X-ray Inspection of Food? At which points in the production process should manufacturers install an x-ray system? An x-ray system can be installed at the beginning of a process to inspect incoming raw goods, at any stage during the manufacturing processing or at the end of the production line. Using the Hazard Analysis and Critical Control Points (HACCP) process is the surest way to ensure products are free from contaminants. Manufacturers should perform a review of the production process and identify risks to product safety. Where a risk of physical contamination is identified, a Critical Control Point (CCP) should be established. In many cases, this can be early in the production process to identify and remove contaminants before adding value to the product. In other circumstances, it may be more practical to inspect during manufacturing or at the end of the production process prior to shipping of the product. Video Collection: Food Safety – Are you Meeting the Standards? Can x-ray inspection support my Overall Equipment Effectiveness and increase production efficiency? False Reject Rate (FRR) is defined as the percentage of falsely rejected products on a production line. Our advanced x-ray inspection software automates product set-up and changeovers to ensure outstanding detection sensitivity levels, minimizing false rejects. Can x-ray inspection help to secure new business? Incorporating x-ray inspection systems into a company-wide product inspection program to ensure product safety and quality helps food manufacturers to comply with national and international regulations, local legislation and standards set by retailers, opening new trade markets. Should I install an x-ray inspection or metal detection system on my production line? The product being produced and the type of likely contaminants will help you determine whether an x-ray system or metal detector is the most suitable technology. You should consider the outcome of your HACCP review. In some cases, using both technologies at different critical control points (CCP's) may be the best option. White Paper: Metal Detection, X-ray Inspection or Both? Are x-ray systems expensive to service? Service contracts should form part of any x-ray system purchase. Regular servicing of an x-ray system, including performance verification, will ensure it is operating at the optimum level of performance. This will prevent food safety issues. Preventative maintenance enables manufacturers to avoid downtime issues due to unexpected maintenance work. All METTLER TOLEDO X3000 x-ray system generators come with a five-year warranty when a service contract is purchased. By protecting the most valuable part of the x-ray machine, manufacturers can have confidence that production uptime is maximized. Why buy METTLER TOLEOD Safeline X-ray? METTLER TOLEDO is a market leader in x-ray inspection for the food and pharmaceutical processing and packaging industries. We are experienced in providing product inspection solutions for products in unpackaged formats as well as in a wide variety of packaged formats such as glass jars, metal cans and other retail packaging. A global network of service engineers are on-hand to guide manufacturers on how to optimize the performance of inspection systems. We support and service x-ray equipment through its entire lifecycle. BRC Issue 8 – What are the Key Changes?